I wanted to connect my Wii Classic Controller to my Raspberry Pi 3. Here is how I did it. The site Robot Electronics has an I2C tutorial that explains the need for pull up resistors when making I2C connections. I used two 10 K pull up resistors and connected the four pins (3v3, SDA, SCL, and ground) from the Wii Classic Controller to the Raspberry Pi connector (pins 1, 3, 5, and 6). I am using a stock Raspbian image (as of January 2017). The goal is to read the Wii Classic data and translate it to virtual keyboard presses thru the linux uinput device. After a reboot, confirm that is shows up with read/write privileges for all. Now, this page has useful lower level info about writing C code to use uinput, but ultimately I installed libsuinput to handle the details. I installed wiringPi to use the I2C library. 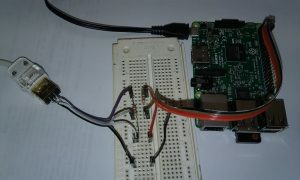 I2C can be enabled on the Raspberry Pi using raspi-config. The delay times after I2C transactions and keys to output can be customized. The delay times provide enough time for I2C transactions to occur. They probably can be less, but the values I’ve used seem to work okay. According to wikipedia, input lag becomes distracting around 200 ms, so keep the delay times much less than that.